Ouss Cisse ran to Mel Gwinnett after scoring the opener against Newport County on Saturday because the coach had predicted the Mali midfielder would score. 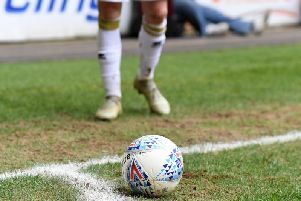 Nodding in Conor McGrandles' cross on 57 minutes, Cisse netted his second goal of the season as Dons went on to beat the Exiles 2-0 to remain in the promotion hunt in League 2. Speaking afterwards, Cisse said he went to find Gwinnett after his celebration because the coach had told him a day earlier he would score from the very same routine they had been practising. "I worked hard on Friday with Mel (Gwinnett) and he told me I was going to score! Exactly the same set piece! I went to him after I scored and hugged him! "We needed this goal. We stayed strong, kept a clean sheet and the goal opened the game – they had to try and score to get level. From there, we could play a bit more football and Chuks could score. It was a great performance from the whole team." With teams above them all winning as well, Dons' victory means they remain just two points outside the top three and six adrift of leaders Lincoln, while there is now a five point gap to Colchester and the rest of the chasing sides in the remaining three play-off spots. But while they are beginning to open a gap to Colchester, Forest Green and Exeter, Cisse says the play-offs are not the aim for Don this season. He continued: "We have to stay with Lincoln, Bury and Mansfield. We want to be in League 1, not in the play-offs. We have to win every game, and if we don't win, we cannot lose."